Some quick Googling revealed this Microsoft TechNet post – which by the way might be the first time in history that a TechNet post was ever actually useful. Select “Next >” in the dialog box that pops up. Follow the instructions to import your certificate and private key, providing your password if required. Once your certificate and private key have been imported, double-click on your certificate in the right pane. Uncheck “Full control” for the NETWORK SERVICE user. Select “OK”, and close the Microsoft Management Console. If prompted to save changes, select “No”. Select “OK” and close the Registry Editor. 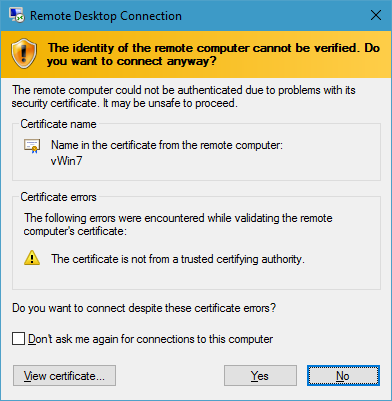 The Terminal Services service does not need to be restarted, the certificate will be loaded the next time a Remote Desktop connection is initiated.